The most anticipated Blu-ray release ever -- the Star Wars Saga -- emerges from light speed this September 2011. For the first time, all six of George Lucas' epic films (Episodes I-VI) are united in one complete set. Fans worldwide are able to pre-order now with online retailers. Flanked by a legion of his finest Imperial stormtroopers, Darth Vader himself joined Twentieth Century Fox Home Entertainment President Mike Dunn at the Consumer Electronics Show (CES) to announce the release, vowing "The forces of the Empire will be at your disposal to assure the success of this endeavor." 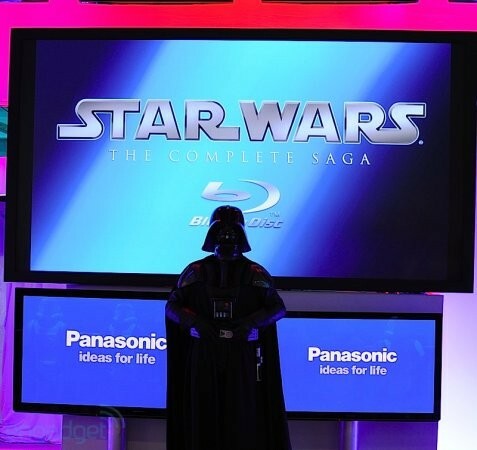 "The Star Wars Saga is the most anticipated Blu-ray collection since the launch of the high-def format," Dunn said. "The epic franchise pioneered sound and visual presentation in theaters and is perfectly suited to do it again in the home, with a viewing experience only possible with Blu-ray." "With all six episodes available for the first time in one collection, this is a great way for families and home audiences to experience the complete Saga from start to finish," said Doug Yates, Vice President of Marketing, Online, Distribution, Lucasfilm Ltd. "And with the quality of high-definition, Blu-ray provides the most immersive home experience possible." "The Star Wars franchise has been the most anticipated Blu-ray release by Amazon's customers," said Bill Carr, Vice President of Music and Video at Amazon.com. "We think that Star Wars will be incredibly popular with our customers, and we expect pre-orders to be very strong." Pre-order Star Wars: The Complete Saga on Blu-ray and the Star Wars: Trilogy Sets at Amazon.com today!